A few inches. A missed shot. A changed world. What would have happened if Kennedy hadn’t been killed? Davenport asks this question in his first novel, inspired by his time at the UC San Diego School of Global Policy and Strategy (GPS). 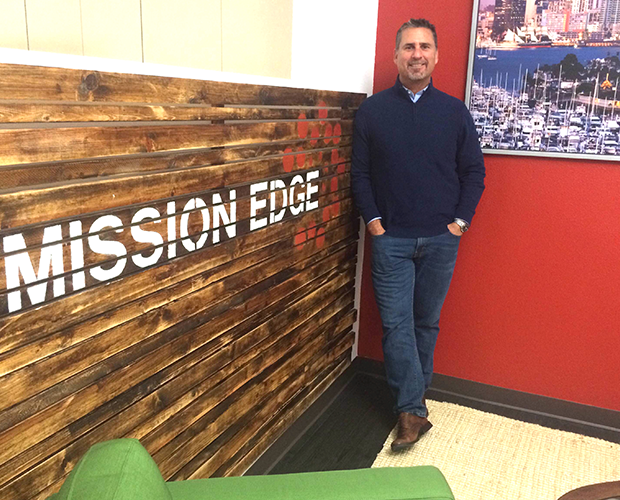 As an alumnus from one of the first graduating classes, Davenport gives back to the School time and again, in both mentoring students and providing internships at his company, Mission Edge. With a full-time job and family, Davenport is a man of many hats, writing nights, weekends and mornings to fulfill a dream. In our interview, we get a chance to talk startups, nonprofits and GPS’s interdisciplinary spirit. Please tell me what inspired you to write your first book. I started writing “The Two Gates” ten years ago. I got 80 pages in and I put it away…I got writers block. It wasn’t until fellow alum Eliot Peper ‘11 encouraged me to go back and finish it. As a published writer of several books, he told me to write it for myself. I started writing and I just keep going. I attribute the book to him. 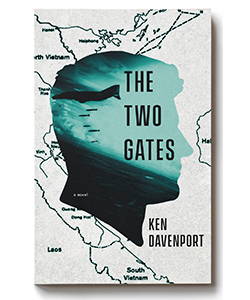 While the book is all speculative, it’s based on real conversations and dialogue around Vietnam policy. Did lessons learned at GPS play a part in influencing the book? The book has an Asia focus. My knowledge of the region was certainly helpful in crafting the pages, since a lot of the book does concern Vietnamese politics and characters. More so, learning to write and write well, I definitely attribute to my experience at GPS – the ability to convey your thoughts clearly and concisely. I have always been interested in writing and used to write a lot of blogs and a number of op-eds. I was looking for a creative outlet. With writing, it’s your art, you created it and it comes out of your head. People can like it or not like it, but you give it to world and its uniquely yours. It was a big test and took a lot of drive. How did your time at GPS influence your career trajectory, including being a now published author? I studied political science as an undergrad, just when GPS was just getting started. After attending graduate school at the London School of Economics and Political Science, I applied to GPS. At the time, UC San Diego did not have any professional schools. GPS was going to be first of a professional graduate degree to train practitioners and it wasn’t all theory. To me, that innovative spirit made me want to attend. The School was attractive because it was interdisciplinary ­– it had international relations but also economics, management and cultural components. It was a blend that would expose me to things I didn’t know like business, statistics and accounting. It was a great base for helping build a business – those tools were so valuable. You have hosted several GPS students at your company Mission Edge. Can you talk about the value they add? GPS students are fantastic. If I had a choice picking an intern or employee from any of the schools, I would pick a GPS student. Their analytical and quantitative skills are strong and I’ve had great experience with interns. Their work has, and continues to be, really valuable to my company. Very hard working, with a great all-around skillset. How does your company build a stronger infrastructure for San Diego nonprofits? Social enterprise can mean a lot of different things. At the broadest definition, it’s an organization that focuses both on profits and purpose. A company that is trying to help the community but also has a business model that requires it to generate revenue. I think that’s the wave of the future. It’s about doing well and doing good at the same time, with less chasm between the for-profit and nonprofit world. My interest and what we are trying to do at Mission Edge is to help existing nonprofits that are traditionally funded start to diversify its revenue stream. We are creating this for-benefit ecosystem where companies look at social purpose as well as economic return. One project I’m particularly proud of is working with the Honor Foundation, a transition program for Navy Seals based at the UC San Diego Rady School of Management. We help support them with financial infrastructure and grants – it’s a great partnership and very rewarding. Explain what attracted you to social entrepreneurship? It’s a new concept. It’s great to want to give back to the community and have a social purpose, but you have to have an organization that works. You have to have a business that makes money, that makes sense and that is managed effectively in order for you to do anything else. You’re actively involved in the School’s alumni board. What are you most passionate about in this role? I’ve been advocating the value of the internship model at the School – it’s a really great win-win for both businesses and students to get exposed to real world scenarios and build a network. When I meet students, I also always try to convince them that the most important thing they will do is network. Go out and meet people face to face and develop relationships. Nobody gets a job just shooting out resumes. You have to get out and push yourself.